Sunspots can be the size of Earth or as big as Jupiter. Typical sunspots are nearly round with a very dark and relatively “cold” umbra (7,000 degrees Fahrenheit compared to the 10,000-degree solar surface) surrounded by a less dark and warmer penumbra. However, there are no external forces on the Sun that could hold these giant magnetic structures together. They appear and are organized by their own induced forces. Understanding the processes of such self-organization in the hot turbulent plasma is of fundamental importance for physics and astrophysics. Investigating sunspots is much more than a matter of curiosity and the desire to increase the fund of basic scientific knowledge. When sunspots that are close to each other have magnetic fields with opposite polarities, they can produce powerful flares and solar storms. On Earth, this can severely damage communications and power infrastructure. Similar but even more intense magnetic phenomena have been detected on other stars, which may be a factor hindering the development of life elsewhere in our Galaxy. At the AAS meeting, the NJIT researchers presented video chronicling several hours in the life of an isolated sunspot that did not generate solar flares. But the roiling action revealed was a transformative view of sunspots as static-equilibrium structures maintaining a balance between magnetic force and gas pressure. The imaging and data-acquisition systems were developed by the BBSO engineering team led by Wenda Cao, NJIT associate professor of physics and the observatory’s associate director. The data recorded is unique in that it comprises a long, uninterrupted series that allows researchers to look at a sunspot’s life cycle and activity with unprecedented spatial resolution. Previously, only short series or snapshots with such resolution were available. The sunspot data shared at the AAS meeting was obtained on September 29, 2013. The solar surface, the photosphere, was imaged using a red-light filter in the range of molecular TiO lines, to achieve the best contrast in the sunspot’s umbra. Simultaneously, scanning the hydrogen H-alpha spectral line facilitated imaging at five different wavelengths. The H-alpha data yielded images of plasma flows at various layers in the solar atmosphere, enabling the NJIT researchers to obtain a dynamic 3D view of the sunspot. 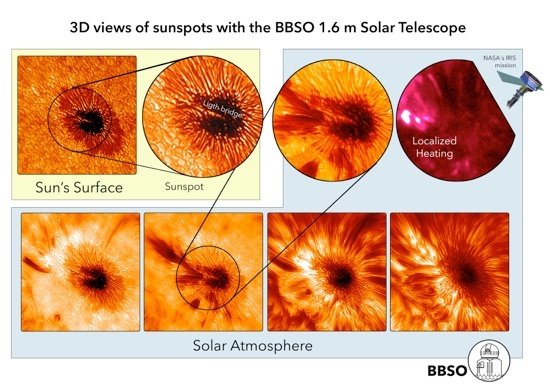 The BBSO data was compared with UV images of the high and hot atmosphere obtained by NASA's IRIS satellite for the same region. This joint observing program allows investigation of the origins of solar UV radiation. The data as presented in the high-definition video shown at the meeting reveals small-scale activity of a generally “quiet” sunspot in unprecedented detail. Remarkably, the organization of small-scale substructures is comparable to that seen at larger scales, indicating the existence of large-scale dynamics which control the formation and stability of sunspots. The most significant UV emissions and violent motion are observed above the area where the penumbra intrudes into the umbra, the so-called “light bridge.” It is likely that this effect is related to anomalies in the sunspot’s magnetic topology, and requires further investigation. Some of the most dramatic events are high-speed plasma jets originating from the penumbra, as well as the apparent chromospheric accretion of dense plasma sheets into the sunspot. The origin of the accretion flows is another puzzle. Looking ahead, the NJIT researchers plan to use quantitative diagnostics to study plasma and magnetic-field properties through analysis of polarized solar light, and to integrate realistic numerical simulations performed on supercomputer systems into their work. Comparable simulations at the NASA Ames Research Center have revealed a magnetic self-organization process that caused a compact “mini-spot” magnetic structure to form through the interaction of vortex tubes below the visible solar surface. Sunspots, first seen by Galileo more than 400 years ago as dark blemishes on the Sun, are still one of the greatest mysteries of astronomy. It has been known for more than a century that sunspots are compact, concentrated magnetic fields and appear dark because the magnetism prevents heat from rising to the surface from the superhot interior. But why these magnetic fields become so concentrated and compacted in structures that remain stable for days and sometimes weeks in a very turbulent environment is a mystery. The telescope at BBSO that made these unparalleled observations possible was completed in 2009 under the leadership of Philip Goode, NJIT distinguished professor of physics and at the time director of the university’s Center for Solar-Terrestrial Research. 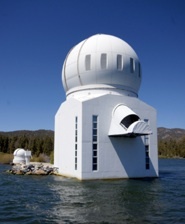 The telescope is equipped with adaptive optics that include a deformable mirror to compensate for the atmospheric distortion of images in real time. Images are captured with very fast cameras in 15-second “bursts” of 100 images, and then processed using a speckle reconstruction technique to improve sharpness. In particular, the TiO images provide the first detailed view of the darkest regions of sunspots, revealing rapidly rotating convective rolls in the penumbra and similarly rotating relatively bright “umbral dots.” The umbral dots form an evolving pattern clearly linked to the outer penumbra structure. Such evolution provides evidence for large-scale flows that probably play a key role in the self-organization and stability of sunspots. The most prominent features in the Sun’s chromosphere are periodic pulses — shocks generated by sunspots at intervals of about three minutes. The shocks, which travel into the high solar atmosphere with a speed of about 45,000 miles per hour, are observed by the IRIS spacecraft as UV flashes above the sunspot. The sunspot’s umbra is covered by ubiquitous eruptions — plasma jets that may contribute to the shocks detected.